Then came the events late 1989 when the wall came down, and in October 1990 Germany was formally reunited. The Bundestag of the enlarged Germany declared that Berlin would be its capital and would also be the location of its parliament, so the Reichstag building would be in business again. 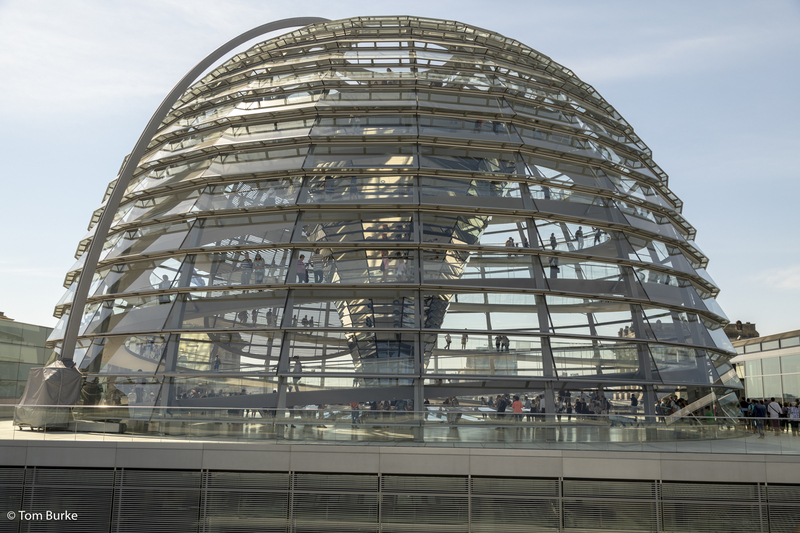 Sir Norman Foster won an international architectural competition to reconstruct the building within the existing shell, and his design included a new dome, of steel and glass, on the roof. The construction was finished and the Reichstag building held its first session of the parliament of the Federal Republic of Germany on 6 September 1999. The dome is open to visitors, and I had made an appointment on-line in advance. When arrived I found that a number of other people also had the same time slot. First, after being checked against the list of registrants – I had to have id for that so I had my passport – we were all taken into the ground floor of the building. Then we entered a very large lift (elevator) capable of holding perhaps 30 people, which took us straight to the roof terrace level where we all got out. From then on we were free to walk around as we wished. There’s a large terrace on the roof with the dome in the centre. I walked around the terrace for a while before going into the dome. In the centre of the dome is a large circular display/exhibition – it recounts the history of the parliament and of the building. It doesn’t shy away from the events of the 1930s under National Socialist regime. Rising up from the centre and fanning out as it rises is a large mirrored column, and around the side is a spiral walkway/ramp. Actually, two ramps, one for visitors ascending and the other for those descending. At the top of the ramp is a small open area just below summit of the dome, which is in fact open; wind, rain and snow all enter this top chamber. This top chamber also houses a funnel that rises from the column – it’s suggested that this allows hot air generated in the debating chamber far below to escape! I found this to be an interesting visit, with the added bonus of some dramatic architecture. I’d recommend it for visitors to Berlin.